It has been variously described as a banyan tree, a literary Woodstock and even a sahityik Kumbh Mela. 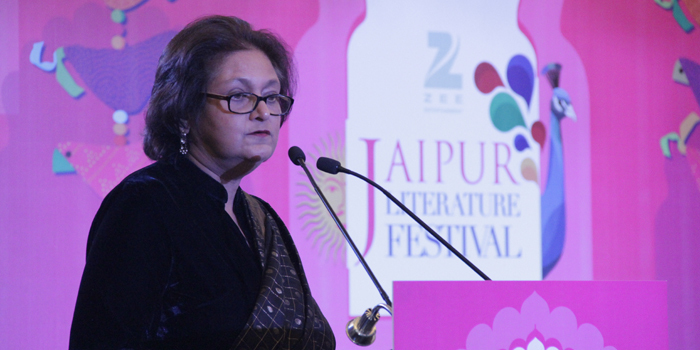 But author and co-director of the Jaipur Literature Festival (JLF), Namita Gokhale, describes the largest, free literature festival in the world as something extraordinary. a�?One of the wonders of the thinking world, it is the most magical spot anywhere. And the thing about magic is that no one ever knows the secreta��if they did, it would be a trick,a�? smiles Gokhale, adding that the eighth edition will continue to showcase global and local perspectives to make sense of our changing times. Conducted from January 21-25, at the historic Hotel Diggi Palace, this year will see 234 speakers. Add to that 117 musicians and artists, and the number of participants goes up to 351. a�?Ita��s been a miraculous growth as far as participation goes, too. Since it started, it has doubled in size every year, with last year seeing over a quarter of a million people,a�? says author and co-director William Dalrymple. This year, the festival has several highlightsa��the most talked about being Nobel laureate VS Naipaul and acclaimed travel writer Paul Therouxa��s first appearance together after their falling out in 1996. a�?Ita��s also been 54 years since A House for Mr Biswas came out and this could very well be one of Naipaula��s last public events,a�? explains Dalrymple, adding that the list of attendees is quite formidable as a�?several writers I have been chasing for decades have finally buckled. No one has really copied our technique: bringing the world to Jaipur and Jaipur to the world. Namita scours Indiaa��not just for the ordinary, famous Indian writers in English that we see everywhere, but also for the really obscure ones, like Dalit poets in Punjab or a defrocked nun who has written an amazing memoir in Tamil. She puts together an amazing programme of forgotten literature, while I bring in the big international billboard names. Thus we mix deep roots with big fireworks.a�? From Dalrymplea��s personal hero, literary critic Alberto Manguel, to 2013 Man Booker Prize winner Eleanor Catton, the different sessions will also see names like novelists Hanif Kureishi and Elizabeth Gilbert, current Man Booker Prize nominee Neel Mukherjee, and poets like Kedarnath Singh. a�?Visual arts is also a big segment, with people like art historian BN Goswami and Pakistani artist-writer Salima Hashmi participating,a�? says Gokhale, besides a big contingent of Bollywood stalwartsa��including writer Prasoon Joshi, actor Naseerudin Shah and director Vishal Bhardwaja��who will discuss films and books, poetry and autobiographies. In its second edition, the b2b platform (on January 21-22) will once again create a space for the global publishing community to discuss issues, challenges and ideas. a�?If we are talking books and dialogues, then we have to talk about publishing as well. At the moment, it is at a very crucial phase with changing mediums and technologies. We are proud of the conversations that are emerging,a�? says Gokhale.
? Hay-on-Wye (Britain): Held in the first week of May, a beautiful time of the year, the locale is incrediblea��the Black Mountains ?A� Sydney Writersa�� Festival (Australia): Also a beautiful locale (Sydney Harbour) with a huge young audience ? Mountain Echoes Literary Festival (Thimpu, Bhutan): It is small but very sweet ? Saint-Malo Literary Festival (France): Besides the conversations, I love the oysters and champagne ? Mantua Literary Festival (Italy): When you get away from the books, try their biscuity cake. In September this year, JLF is heading to the US. a�?The unique spirit of Jaipur has inspired new partnerships and opportunities to curate readings and conversations across cultures and national boundaries. The planned collaborative event in Boulder, Colorado, sounds brilliant and I am looking forward to it,a�? admits Gokhale. a�?One of the reasons why this festival has done so well is because, of all the countries in the world, India has always had a great tradition of public performance in literaturea��from the poetry competitions of the Sangam poets in Tamil Nadu and the great courts of medieval India with their bards and mushairas, to the performances of the Bauls,a�? says Dalrymple. According to the directors, there will be a strong emphasis on poetry, writing in South Asia, and literature of the North-East. There wil also be a session on writings associated with The Seven Deadly Sins, a continuation of the a�?Women Uninterrupteda�� series, besides themes like the meltdown in the Middle East and Af-Pak, historical fiction, alternative sexualities, memoir writing, natural history and even the life cycle of the honey bee.